With only week remaining in college hockey’s regular season, Kings’ prospect Paul LaDue has made a name for himself this year at the University of North Dakota. A true freshman, LaDue will be looking to finish the year strong after his team just split of pair of games with St. Cloud State. After being selected by Los Angeles at the 2012 NHL Draft, he played one more season with the Lincoln Stars of the USHL before beginning his college career last fall. Known for being an offensive-minded defenseman, it’s his other assets that have been on display at UND. For example, in the 17 games played since Dec. 7, his plus-20 ranking is the best among all NCAA Division I defensemen over that span. “He came in a very mature and ready player, [but] we're starting to see that consistent level out of him,” said UND coach Dave Hakstol. "I think he's played well for us from the start of the year. He's probably had a little more offensive success over the last month or so. I think he's just steadily gaining ground and playing his game." Looking at just freshman within his conference, LaDue’s overall mark of plus-14 on the season leads the pack, and his 15 points (5 goals, 10 assists) are the most among all rookie blueliners. 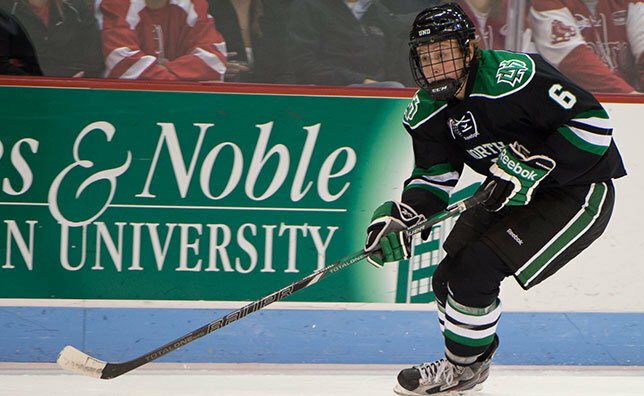 When fellow Kings prospect Derek Forbort was playing at UND as a freshman four years ago, several of GM Dean Lombardi’s top scouts at the time noted how impressive it was to see him getting significant minutes as a first-year player at one of the country’s top college programs. The fact that LaDue has been doing it this year though may be even more impressive. He hasn’t been a healthy scratch for one game, and that’s on a d-core than includes five other drafted players - Jordan Schmaltz (1st round, STL), Keaton Thompson (3rd round, ANA), Dillon Simpson (4th round, EDM), Gage Ausmus (5th round, SJS), and Nick Mattson (6th round, CHI). "We knew he was going to be ready to step into our lineup," added Hakstol. "Certainly, he's done everything to meet the expectations and hopes we've had for him." LaDue gives part of the credit for his development this season to UND assistant coach Brad Berry, who played over 400 games in the NHL and spent time as an assistant coach with the Columbus Blue Jackets before returning to his alma mater. "He obviously knows how to develop players,” said LaDue. “He's very involved with all of our drills and running us through our individual shifts on video too. There’s a lot of focus on getting shots through, trying to walk the blue line. Defensively, he helps us with stick-on-puck and trying to contain guys in the corners and battling in front of the net. He's just been fantastic." Back in Los Angeles, LaDue has also received some additional work from the Kings’ staff at their annual summer Development Camps. It’s also an opportunity that that LaDue wasn’t sure he would ever have. It took all the way until the sixth round of the 2012 Draft before he finally heard his name called. Now, as a 21-year-old looking to take his game to the next level, he says he continues to apply the knowledge passed on to him from all his coaches along the way, as well as soak in what he continues to learn from those who have worked with him since he was drafted. "It's just a lot of little things. Practice habits, skillful things,” he said, when asked what areas he’s still trying to polish and perfect. “In L.A., they preach a lot about the mindset of the LA Kings. Every repetition in practice is important. You have to practice like you're playing. Obviously, they play hard - they're a hard-nosed team – so, you have to go out there and do all the extra little things on the ice. I went there and I heard a lot of new things I've never heard before, even though I've been playing hockey for 14 years. It just opened my eyes to the pro lifestyle and how you have to play to be a pro." Those details seem to have made a big impact on LaDue’s mindset this season, yet he’s still processing how important repetition is to having a lasting career in the National Hockey League. "Once you hear those things, you kind of think a little bit differently and you take a little bit more pride in your practice habits and working out. You appreciate what the professionals do and what they did to get there." Hard work is nothing new for LaDue though. Since strapping on his first pair of skates as a 3-year-old and playing on the outdoor rinks in North Dakota, he’s been able to pattern his approach after his father, who played Division III college hockey in Minnesota. "He was probably my main influence,” said LaDue of his formative years. “He grew up playing the game, so he's always had a passion for it and that’s something I took it from him. He helped me out immensely along the way." Curiously enough, he can’t remember exactly how or why he became a defenseman. One point he’s crystal clear on though is choosing the college hockey route, rather than opting to play for a Canadian major junior team. “I think that college is always the best option,” he stated with a tinge of authority. “Growing up in Grand Forks, watching the University of Dakota every weekend, it was a dream of mine of play college hockey and to play here." At the same time, that doesn’t mean everything has been easy. He’s no different than any other freshman athlete across the country when he talks about the challenges of adjusting to campus life. "It’s difficult to balance your school work with hockey and everything that's going on, it's two different worlds,” he said. “Being on the road so much, you have to do homework on the road. Coming from [the USHL], where your main focus is on hockey, you have to be on the ball here with your schedule and you have to manage your time a little bit differently. You can't hand in homework assignments two weeks late like you could in high school. I think it definitely gets easier over time, as you start to figure things out." Ironically, just like Forbort revealed a few years ago, LaDue’s favorite freshman class has been the acting class he had to enroll in. Have they taught him how to ‘sell’ a penalty yet in this acting class? "No, but I might have to ask them about it,” LaDue quickly quipped.